I contend that the majority of character shapes in Gill Sans are actually worse than in Johnston’s design of fifteen years previous. Gill Sans achieved its pre-eminence because of the mighty marketing clout of the Monotype Corporation and the self-serving iconoclasm of its author. Thus, rather than Johnston’s lettering, it was Gill Sans that became the English national style of the mid-century. The initial lowercase ‘a’ versions were far better than what made the final cut (pictured far right). The addition of the crazy ‘a’ tail calls into question the removal of Johnston’s tail on the lowercase ‘l’. Digital versions of metal typefaces are often missing critical elements of the original. The heavy weights of Gill Sans are “aesthetically unjustifiable”. Update (Mar 13, 2007) — Romesh Naik of Stuttgart has generously hosted photos of Granby specimens from a Stephenson, Blake book: here and here, including an interesting Inline version. Naik has many more wonderful images of specimen books in a Flickr set. Probably the most complete and usable of these alternatives, Bliss improves on nearly every failing in Johnston and Gill Sans. It’s also a great replacement for Frutiger and Syntax. “Forms were chosen for their simplicity, legibility, and ‘Englishness’”. See also Tankard’s Wayfarer, inspired by Granby. Released a few years after Bliss, Sterling seemed like a bit of a bandwagon jumper, but it has its own merits. English Grotesque (1998) by Rian Hughes for Device. An undiscovered modern alternative with plenty of cuts. Preston makes some of Gill’s decisions (lowercase ‘t’) seem workable. Astoria Sans (2011) by Alan Meeks. Very similar to Gill Sans in the middle weights, but much more uniform and compatible in the extremes. There is also a wedge-seriffed companion. Giangiorgio Fuga has posted a 1938 specimen of a version of Gill with the more sensible ‘a’ and spurred ‘p’, etc. 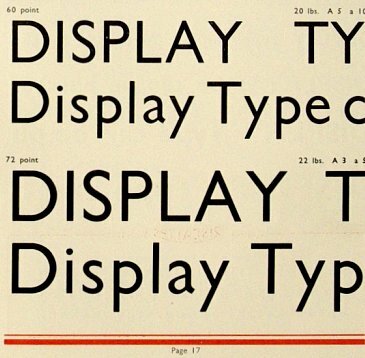 The sample reproduced in Sebastian Carter’s Twentieth Century Type Designers (new ed., p. 77) also shows the “sensible a.” Jamie Barnett’s essay in Revival of the Fittest assumes that the hooked tail is a change made with the digital version of the typeface (p. 149). You might include as one of your alternates the recent release by P22 of Johnston done by Paul Hunt. If I recall correctly, Paul Hunt made a case to me in a conversation that there is plenty of additional potential in what is unresolved in Johnston and Gil. I thought he was right then and these days I really think he was right. Ben Archer’s piece also features Fedra Sans. I like the way this list pulls in Bliss and Frutiger, providing a connection between seemingly disparate type families commonly classed as ‘humanist sans’. My own problem with Gill Sans, as a Londoner, is that it’s hard to separate from London Underground’s corporate image-I think that’s something any company with a London presence has to bear in mind. That goes double for Johnston, and treble for anyone considering using lower case of either since they’re particularly distinctive. I really like the light weights of Gill Sans and feel they’re underrated, though I believe the BBC uses them. I also do think Eric Gill’s personal life is a major issue for anyone considering using Gill Sans. A year on, another comment on this great article! This frustrated me so much when I started using it, but now I think the best thing that ever happened to Gill Sans was that for most of its history there hasn’t been a widely available regular weight for it. Double or quits, no safe choices: you get a very thin light weight or a solid standard most fonts would consider bold, and that’s it. There are lots of humanist sans-serif fonts around now, but none have Gill Sans’s presence. (I know the pro version does have a book weight, but not many people have that.) Gill Sans is just not a body text font. Relatedly, I love the humanist sans-serif genre but honestly there’s a lot of competition now, as this huge list shows, especially among body text fonts. Myriad and Frutiger started it, of course, and Scala and Charlotte. Does that mean typeface designers (I’m not one, to be clear) should give up? I hope not: I think I see gaps in the market. With 575 years of serif type history, there are areas that haven’t made the cross into sans-serif typefaces. You don’t see many sans-serif designs with optional swash italics. I’d love to see a daring new sans-serif take on ornament or jewel fonts (something along the lines of what Requiem comes with). Is it possible to create a modern take on engraved capitals? Many seem created solely for InDesign and the web: the optional separate small caps fonts for Office users really seem to have fallen by the wayside these last few years, which is a shame since they’re no extra work to make. (I sometimes recommend Alegreya, an open-source design, to others these days, partly because it has them.) Above all, I see very few that take inspiration from handwriting without actually being script designs. Do you instinctively write q with a flick up at the end? Lower-case a that’s not a perfect Futura circle, and d with a curl at bottom right? Me too: that’s what I was taught. But most typefaces aren’t designed the way people think letters should look if you give them a pen and ask them to draw them. I’d love to see good ones that are. What about LL Brown by Lineto? Recent discovery which I really love (and tying into my comment above): take a look at Sassoon, a family intended for teaching handwriting to British schoolchildren in an upright italic style. It feels like the missing link between Gill Sans, Joanna’s italic and handwriting. Because it’s intended for educational use there are some clunky aspects to the design (the cross-barred I is a bit ugly) and the range of styles is limited, but for me it nails the feeling Gill Sans has always had for me of feeling completely natural and sensible, the model of what you expect letters to be-the a and k in particular really are excellent. And unlike Gill Sans, it’s not just sensible but charming. I think it could easily be used across a much wider range of display and even body text uses to considerable success.